The Plant of Renown is a vehicle to be used to bring the Body of Christ together in unity, and to see Gods perfect will to be done on the earth. It is raised of God for His Glory alone. It is a collection of Christian believers united to "girdle the globe and circle and earth" with the gospel of Jesus Christ, and to help prepare the Bride of Christ for His coming. It is a corporate body of believers with a sole purpose in view. The Word of God teaches us the value of agreement . With this kind of agreement, the Church of the Living God will become an effective force in the spiritual realm, as well as the political, economic and secular realms. World: A symbol of our vision for a world-wide revival. Dove: A symbol of the Holy Spirit and a former and latter rain outpouring of God's Spirit on the earth. Trefoil: A symbol of the trinity of the Godhead - Father, Son and Holy Ghost. 7 blue lines: A symbol of the menorah and God's perfect number. Star & cross: A symbol of God's redemptive plan. The star representative of Christ on the cross. A gospel for the Jew and the Gentile. Divided wave: A symbol of the tidal wave God has promised; one half to Israel and the mid-east; one half to the USA and the world. 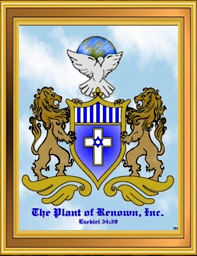 Colors of the symbol: The blue of heaven and the white of the clouds: White - a symbol of purity; Blue - a color used extensively in the tabernacle and temple. Lion: A symbol of the Lion of Judah - our conquering King. Gold: A symbol of the richness of God's grace.